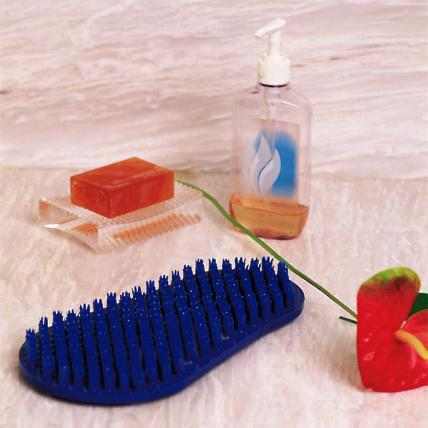 Foot Massage Both Soapy Soles™ foot scrubbers provide the experience of a spa-quality foot massage anytime while ensuring good foot hygiene. 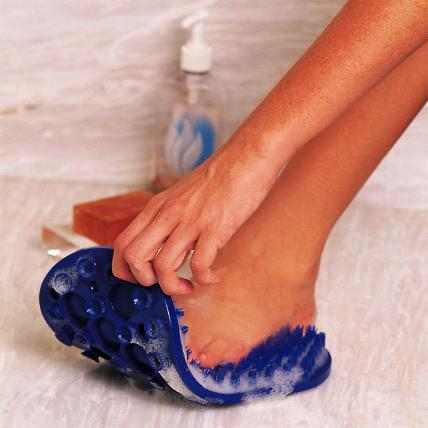 Soapy Soles™ Original 11" x 5" foot shaped cushion of injection molded PVC is durable and easy to rinse clean. Use in the bathtub or the shower, take it with you when you travel. Recommended for diabetics or anyone with skin or circulatory disorders. Gentle Foot Scrubber The unique design of the Soapy Soles™ 'fingertips' provides a pleasant and effective way for everyone in the family to cleanse their feet. Soapy Soles™ cleans your feet with minimum effort, generating maximum results. Accommodates any foot size. Safe to use, no more balancing on one foot while trying to clean the other one. This one-of-a-kind footcare product boasts over 1500 gently rounded "finger-tips" for ultimate scrubbing action and allows users to easily clean their feet while standing or sitting. Perfect for the physically challenged or elderly. Powerful Suction Cups Soapy Soles™ attaches itself via powerful suction cups to the floor of a shower stall or bathtub. Lifts up easily for rinsing, cleaning and using in different locations, but after trying the Soapy Soles™ we're sure that you'll want one for every shower and tub in your house! Great gift idea!! All colors are BACK IN STOCK!!! !